The City of Cape Town currently faces an extreme drought which goes back as far as 2015. The main contributing factor of low winter rainfall over the last few years is strongly tied to the effects of rapid and unpredictable climate change. By you helping to save water, we've had less demand on our water supply, and together we've managed to avoid Day Zero. We need to keep saving to give our winter rains a chance to fill our dams. This can only be done if you and every other capetonian and visitor to Cape Town unites in the effort to spare our Mother City from water rationing. This guide can help you to ration your 50 litres a day. If you have questions relating to water security in the Western Cape and would like to find out more about the City's plans for Day Zero, have a look at these Frequently Asked Questions. While we’ve made progress in our water-saving efforts, we’re still in danger of reaching #DayZero next year. Everyone in the City needs to use under 50 litres of water per person, per day. Not all clothing items need to be washed after wearing it only once. Jeans, pants and jackets are examples of clothing items that can all be worn multiple times before becoming smelly or stained. Carefully sort your clothes that have a smell or stain from clothing that can be worn again. Delay your laundry days to once a week or longer if possible and ensure that you have a full load. 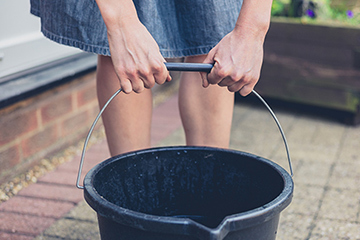 Catch used laundry water in buckets (ensure that your washing machine outlet hose is fixed to something solid) and use this water to wash other loads of laundry. Depending on the type of washing machine you have, manually override extra and unnecessary rinse cycles. Once you have re-used your water for other loads of washing, store the used grey water to flush your toilet only when needed. We can still achieve a high level of personal hygiene with relatively small amounts of water. Adopting a “bucket splash” is one of the simplest ways to achieve this and can be done in a bath or shower. Using a 5 litre container of water, you can soap up and rinse off using your face cloth. Use the remaining grey water to flush the toilet when needed. Don't use drinking water to flush the toilet at home or work. Stick to the “If it’s yellow let it mellow, if it’s brown flush it down” rule. If it does need flushing then use grey water that you’ve collected from your laundry, “bucket splash”, dishes or other sources. The average dishwasher uses as much as 15 litres of water for a full wash cycle. Rather use a maximum of 3 litres of water for your kitchen sink. You can measure the amount of water by using an empty cold drink bottle. Don’t rinse your dishes before washing, instead use a sheet of paper towel to wipe off excess bits of food or oiliness from your dishes and cutlery. Sustaining your garden isn't as important as sustaining you and your family. Don't use municipal drinking water to water your garden. The use of borehole/wellpoint water shouldn't be used so that we can help preserve groundwater resources. If you're using alternative, non-drinking water resources (harvested rainwater, greywater, treated effluent water and springwater), then you need to register your source of non-drinking water with the City and display signage that is clearly visible. Read the detailed guidelines for level 6B water restrictions. WWF South Africa has compiled useful information about about Day Zero that you and your family should consider. For more information on water restrictions or to report leaks, contact the City of Cape Town. Keep up to date with the latest dam levels in the Province.